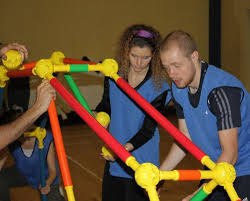 PROJECT CONNECT is a special training program, which was created in the USA in 2001, andhas been intensely developed ever since. It requires the use of unique, patented training tools manufactured by an American company called “Toobeez”. The goal of Project Connect is to help individuals expand their imagination and creativity, but mostly to help build CONNECTIONS. It is extremely useful for building connections among members of a team, or a work crew, as a way to learn cooperation and communication skills, it’s also an excellent way to “break the ice” in a newly formed group of any kind. In short, it’s a dynamite tool, meant to help build well tuned teams, that know how to communicate and how to work together. 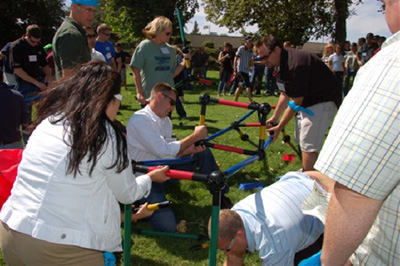 For this reason, the official tools of PROJECT CONNECT have quickly found themselves among the favorites used by coaches and team-building experts across the USA. They’re widely utilized to train management staff, teams of leaders and corporate employees, for whom proper cooperation is crucial. PROJECT CONNECT and its patented training tools have also found uses outside the realm of corporate world. For instance in group therapy, in resocialization and rehabilitation, in youth centers, as a therapeutic tool for the elderly or people with disabilities. Trainings and workshops based on Project Connect are 100% practical and hands-on. There’s no theory, there are just challenges, that require constant communication, cooperation, ingenuity, but most of all they require You to roll up Your sleeves and get Your hands on these tools, provided by Project Connect. If You want to succeed and overcome every obstacle, You have to join in and get to work on a solution… together. Innovative tools manufactured by “Toobeez”, though constantly growing in popularity in the USA, are still, as of now, virtually unknown elsewhere. We are devoted to bringing the benefits of Project Connect’s amazing training program to employees in Europe and everywhere, where it hasn’t been discovered so far. Our tools and methods (EV3 robot building and programming tools; scrum simulations) allow us to create work-like simulations that can include: team working on a specific product, building relations with a client, dealing with sudden emergencies, simulations of chosen scrum process elements etc. Our scenarios can be very dynamic and designed especially to assess given soft and scrum competencies of the AC participants. Contrary to regular AC sessions- which are often highly stressful to participants and can build negative employer image- our service is focused on positive participant experience and scenarios that are fun and engaging. This can be used to build positive recruitment experience and enhance Employer Branding. Scrum Master assessment report (assessment of the following competences: Scrum process knowledge, Time management, Scrum meetings facilitation, Leadership etc.) and Product Owner assessment – based on their performance during the Scrum Training. AC in recruitment – simulations designed especially for the IT recruitment. Our scenarios allow us to test such competencies as: Scrum meetings facilitation, Scrum process knowledge, Time management, Teamwork, Effective communication, Leadership, Coping with stress and sudden change. Development Center – simulations designed to assess competencies of current customers’ employees.